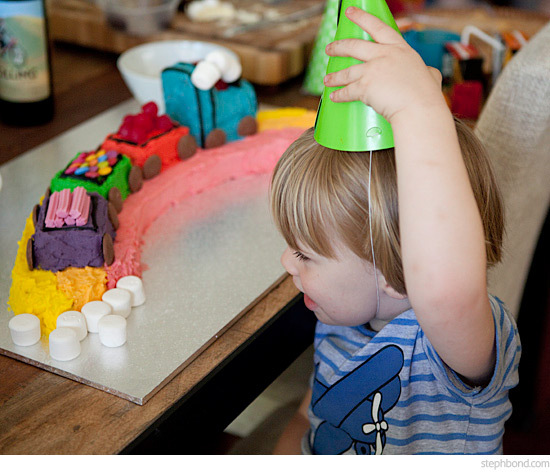 Carolyn from Indie Art & Design is such a creative soul, so when her plans for a Rainbow Connection party were combined with her son's love of the AWW train cake, she rolled with the punches and brought the two ideas together beautifully. 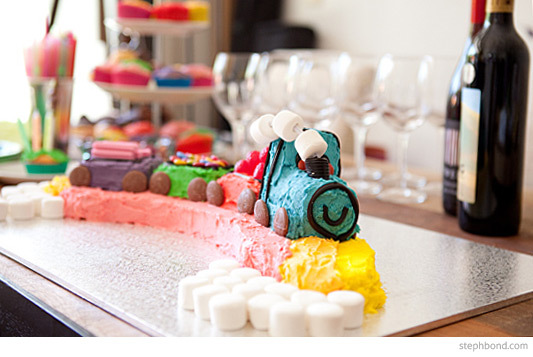 I love showcasing real birthdays on Bondville and Carolyn's is a great example of a fun, relaxed event using just one or two key statement pieces - her gorgeous rainbow train cake and the amazing paper cut cloud and raindrops mobile. 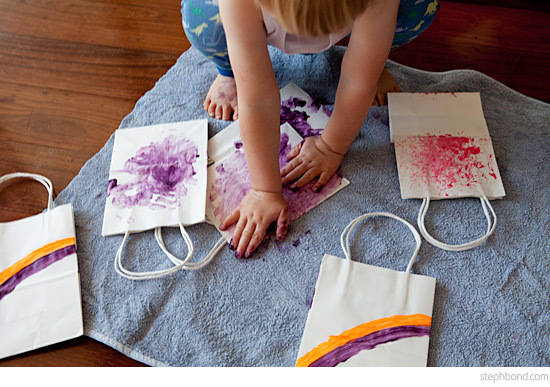 Read on for Carolyn's advice below! 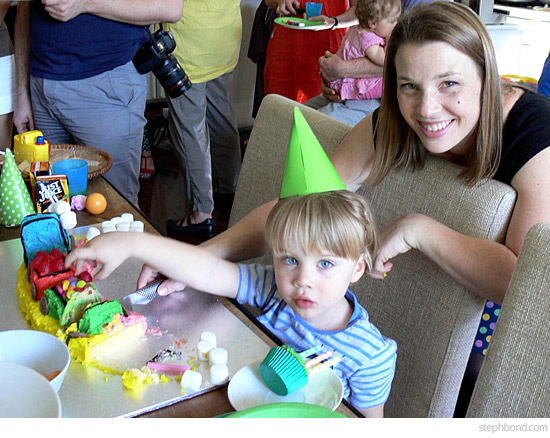 We had a Rainbow Connection party for Liam’s 3rd birthday (based on Kermit’s song), and had been planning either a frog cake (Liam calls himself The Little Frog) or a rainbow cake but when I purchased the Australian Women’s Weekly Children’s Birthday Cake Book, he read it cover-to-cover! When he happened upon the train cake, he literally came running to me shouting “Mummy, Mummy!”. He was so excited! 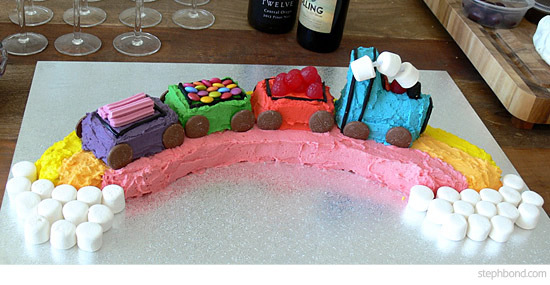 So a train cake it was... chugging along a rainbow! 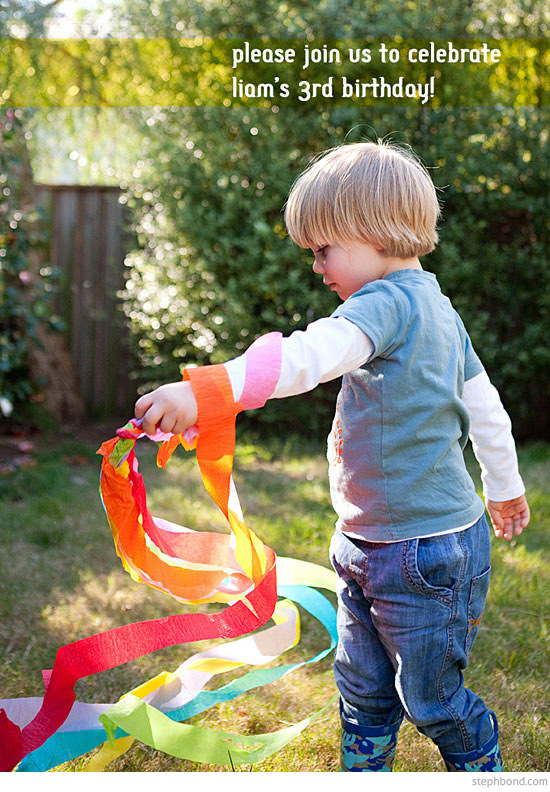 Invitation: I made a streamer rainbow so that I could photograph Liam making a rainbow for the invitation. 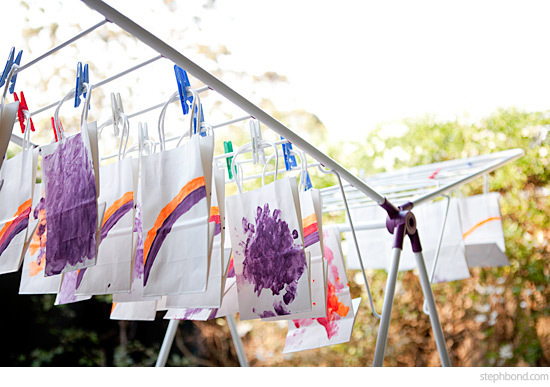 We had so much fun that we made streamer rainbows for all the kids to run around like crazy with at the party! Cake: Rainbow Train cake (I later discovered you can purchase ready-made coloured icing – rather than making seven batches yourself!). The train cake was based on the classic Women’s Weekly favourite. The cutest thing was me trying to replenish the white marshmallow clouds at each end of the rainbow ready for the cake-cutting, as Liam and his friend Eva shovelled them into their mouths! 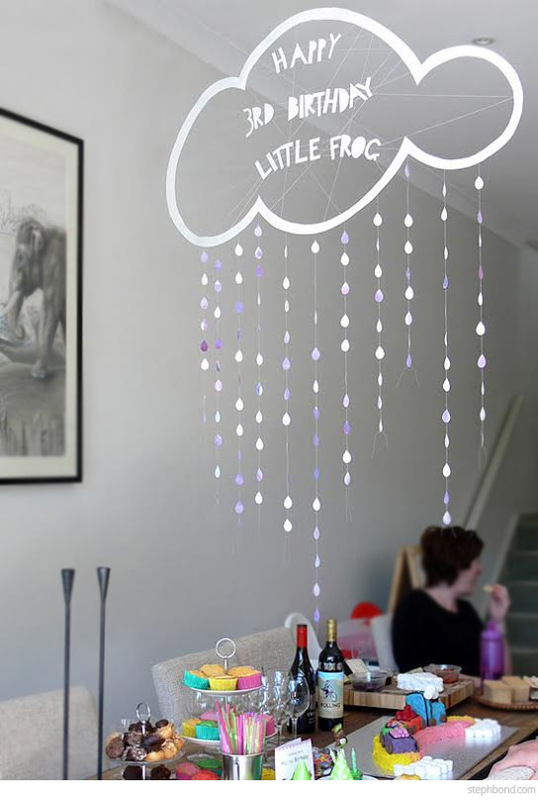 Party food: Frogs in Ponds (a Freddo frog between rainbow jelly layers) which looked amazing held up to the light. I got the clear plastic tumblers for the jellies in packs of four from Kmart. They were very large servings but they looked incredible! 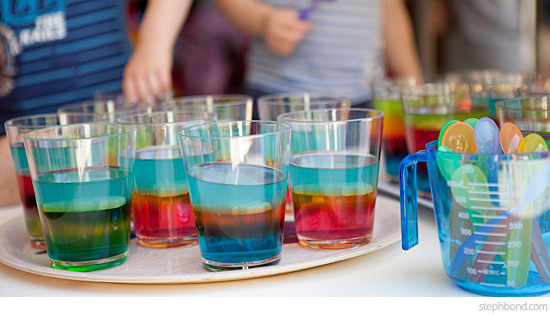 The kids loved them but most just ate enough jelly to get to the frog. 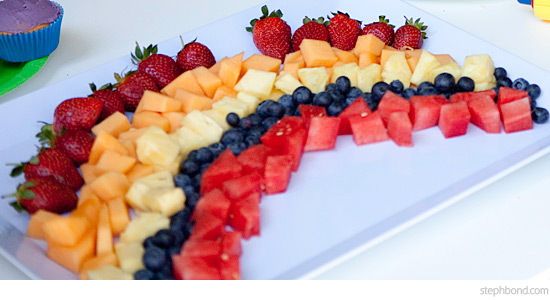 I also made a fruit rainbow platter, little open baguette slice sandwiches, and cupcakes. 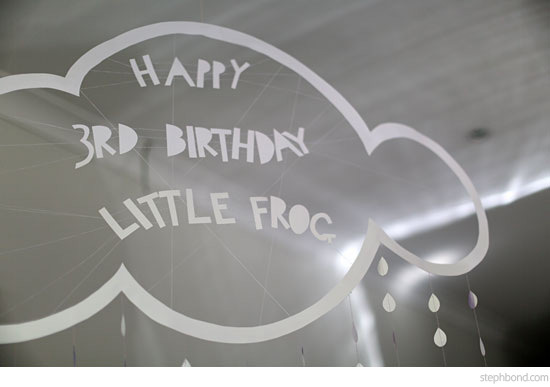 Decorations: Paper cut cloud and rain mobile - hand-painted and stitched purple paper rain drops hanging from a white cloud outline containing the lettering “Happy 3rd Birthday Little Frog”. Liam had ‘invented’ purple rain in a drawing just a few weeks before so I had to make it for him!! I also drew a large rainbow in chalk on an outdoor wall, and decorated with balloons, streamers, and rainbow cushions from IKEA. 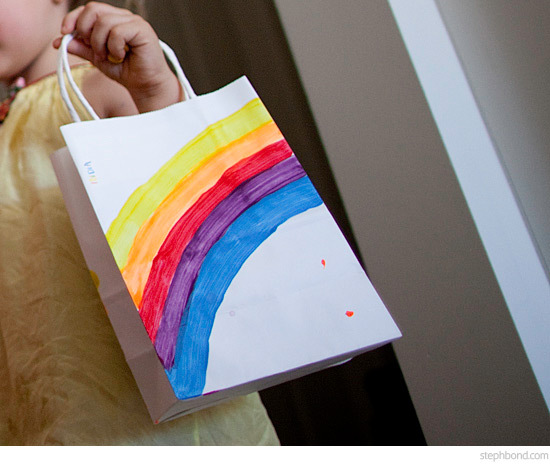 We also spent a few weeks before the party painting rainbows onto white gift bags for all of our little guests. 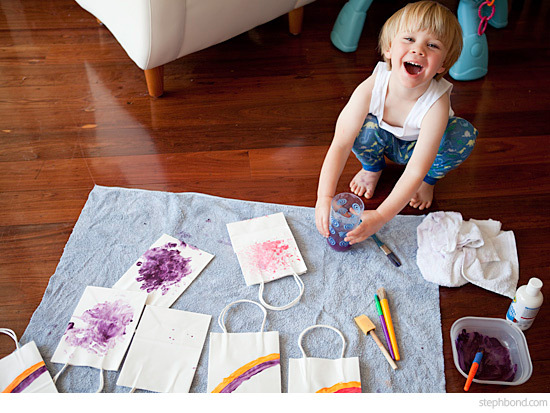 Games/activities: Rainbow streamer running, chalk drawing on the wall under the rainbow, general play! 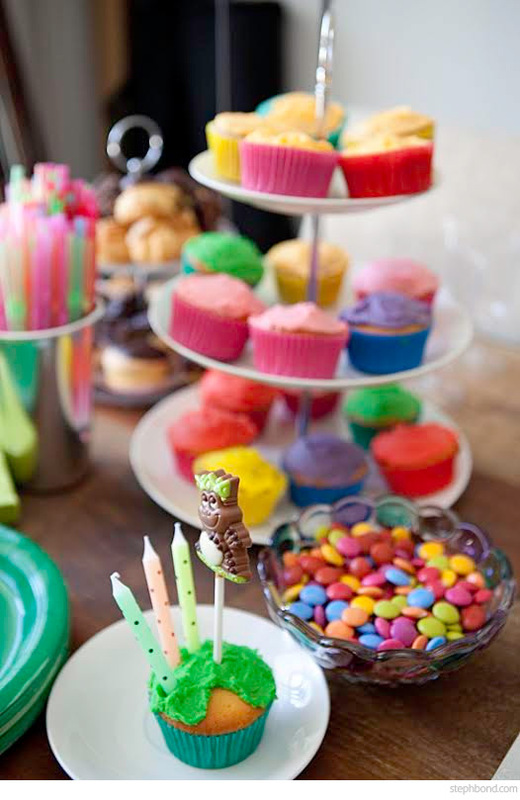 Tips: I was lucky to find 'carriage'-sized cake tins at the supermarket – perfect! 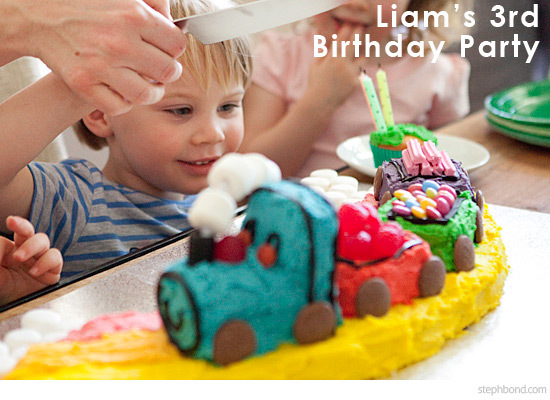 Something special: Seeing Liam’s face light up when he came down for breakfast the morning of his party and saw the cake! Definitely worth all that effort! For our Thank You cards I will include The Rainbow Connection on CD with Kermit singing. We sing it at bedtime every night, and we’d love all Liam’s friends to hear it too. 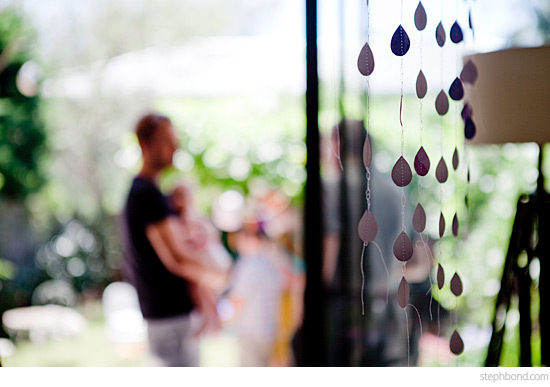 Thank you Carolyn for sharing such a lovely party with us. I love seeing the wine and cheese out for the adults too!